If you're on the hunt for a casual yet totally stylish getup, team a black kimono with navy skinny jeans. Both items are totally comfy and will look fabulous together. Amp up the cool of your outfit by wearing Saint Laurent rock studded bootie. If you're looking for a casual yet stylish outfit, wear a brown fur coat with black leggings. Both garments are totally comfy and will look fabulous paired together. Amp up the cool of your look by wearing Saint Laurent rock studded bootie. If you're scouting for a casual yet totally stylish outfit, make a black leather biker jacket and black leather skinny pants your outfit choice. Both items are totally comfy and will look fabulous together. You could perhaps get a little creative in the shoe department and spruce up your getup with Saint Laurent rock studded bootie. If you're after a casual yet totally stylish getup, marry an olive anorak with black skinny pants. Both items are totally comfy and will look fabulous paired together. Up the cool of your getup by complementing it with Saint Laurent rock studded bootie. If you're searching for a casual yet chic getup, pair a black crew-neck sweater with black leather shorts. Both items are totally comfy and will look fabulous paired together. 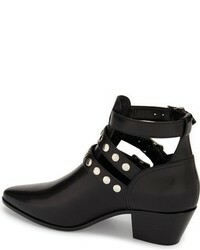 Grab a pair of Saint Laurent rock studded bootie from Nordstrom to va-va-voom your outfit. If you're searching for a casual yet chic getup, pair a dark brown shearling jacket with navy and white check shorts. Both pieces are totally comfy and will look fabulous paired together. 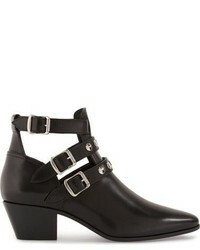 Take a classic approach with the footwear and go for a pair of Saint Laurent rock studded bootie. If you're on a mission for a casual yet stylish look, wear a black tunic with black leggings. Both pieces are totally comfy and will look fabulous together. 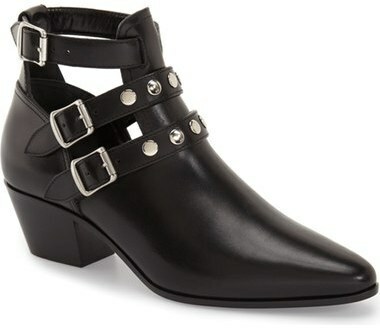 Kick up the cool of your outfit by wearing Saint Laurent rock studded bootie. If you're in search of a casual yet totaly stylish ensemble, pair a black leather biker jacket with a silver maxi skirt. Both items are very comfy and they will also look great paired together. Amp up the cool of your ensemble by complementing it with Saint Laurent Rock Studded Bootie. This pairing of a camel coat and white ripped skinny jeans is simple, stylish and super easy to replicate! 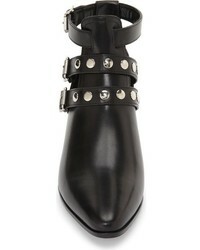 Let's make a bit more effort now and grab a pair of Saint Laurent rock studded bootie.